It’s a new day and we have a new cookie to check out! This time coming from Performix who seem to be expanding their edible range with their new protein cookies being added alongside their previous hit protein wafers release. This time Performix are looking to up the game, bringing in award winning chef Jimmy schmidt to formulate the cookies. We’re not sure if he also designed the cookie’s look, but we’ll give perfomix 10/10 for ‘looking awesome!’. SO WHAT’S IN IT & WHY? Each cookie is weighing in at 90 grams, with each one containing the following: 360 calories, 26g fat (14g saturated), 320mg sodium, 23g carbs (3g fiber, 14g sugar) and 20g of protein. 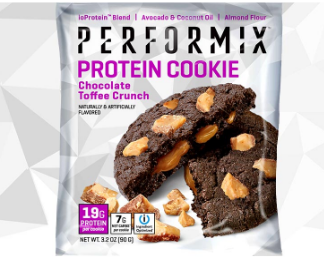 As you can understand from looking at the label, Performix are aiming at the meal replacement protein cookie here rather than a calorie efficient protein snack. 90 grams of cookie is one of the bigger we’ve seen, and 20g of protein compares favorably to most of the other competing cookies we reviewed before (ProSupps MYCOOKIE, MuscleTech Protein Cookie). One thing that Perfomix did differently here, is that they clearly took a decision to cut the carbs by 50% and added these calories to fat. Which for some might be a no go. The cookie is definitely higher up in the FAT department at 26g (14g being saturated) not what we are used to seeing. As of now, we know the cookies will be released in 4 different flavours, Including Snickerdoodle, Chocolate chunk, Chocolate peanut butter and chocolate toffee crunch. And if they taste as good as they look we are definitely pumped to get our hands on them! Currently we know they will be released at $2.50 per cookie. And a box of 10 cookies priced at $24.99 The best way to get a great deal on Performix Protein cookies or any other supplement, is to keep on checking our site, as we continue to hunt down the best deals for everything fitness. There is a new and always growing demand for ‘functional foods’ out there today and Performix are really trying to become a crowd favorite, bringing in a famous chef as their secret weapon. When these are out we will be one of the first to let you know how these taste!